This week could see significant developments for two of the most visible companies in NewSpace. 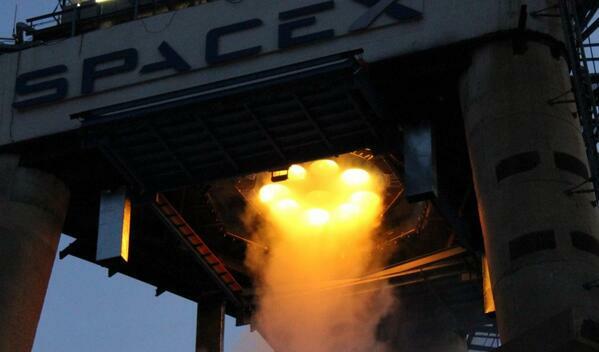 Things got off to an early start with a tweet from Elon Musk dated 5:54 AM Sunday, announcing an ignition test for the “Falcon 9-R (reusable) ignition system.” The nomenclature is interesting, as it might have been expected to be identified as the Falcon 9 V1.1 first stage, and could be a small indication that SpaceX is increasingly confident in its approach to reusability. Whatever it is ultimately called, the next major step is a full-scale mission length firing of all nine Merlin 1d engines, an event which could come at any time, as indicated in this Wacotrib.com article from Friday, which indicates that the company has given advance notice that things are about to get very loud. Another notice, this one a Notice to Airmen, was the final indication that Virgin Galactic is at long last about to conduct the first powered test flight of SpaceShipTwo today, at the Mojave Airport. Parabolicarc.com has excellent coverage of events taking place at Mojave, and will be a great resource for details on what could be a historic event. It is has been almost 9 years since SpaceShipOne made its first suborbital flight over the same skies on June 21, 2004, and it has been a very long wait for those in the space community who saw a new vision of the future being unveiled that day.